Voted “Best Acoustic Guitarist” By Readers of Guitar Player Magazine, the Versatile Musician Composer Kicks Off his Latest Jaunt Friday, November 30 in Mill Valley, CA. 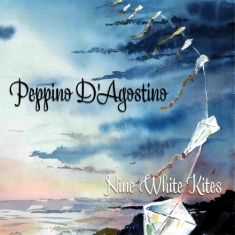 Italian-born, U.S. based acoustic guitarist Peppino D’Agostino is gearing up to fly Nine White Kites—the name of his recently released first album of new compositions for the guitar in a decade—in several cities during his upcoming tour, starting on the West Coast on Friday, November 30 at the Sweetwater Music Hall in Mill Valley, CA. Known for what the Chicago Tribune praises as his “virtuosity and complexity,” as well as his gift for composing “memorable melodies,” the renowned multi-talented performer brings his trademark poetic eloquence and grace to venues stateside in the Northeast. D’Agostino has made a considerable international mark as a musical artist on the guitar since he arrived in America a little over 25 years ago. The readers of Guitar Player voted him Best Acoustic Guitarist in 2007, and the following year in Acoustic Guitar‘s People’s Choice Awards he won a Bronze medal forBest Acoustic Album of All Time for his 2002 release Every Step of The Way (tying with Leo Kottke, one of his prime inspirations) and another Bronze award as Fingerstyle Guitarist of the Year.